Ladakh in July – How to Plan your Journey? It may not get called as the best time but in my opinion, majority of the tourism in Ladakh happens in the month of July. Without any doubt, this is the month when tourist activities here are at their best; and the entire land is vibrant with colorful visitors from all over the world. People continue to visit in August and September as well; and some people visit even before July; but the kind of enthusiasm you see at this time of the year is hard to find in any other month. I have been to Ladakh several times in 7 different months of the year but of all, July by far is my favorite month to be there. If you too have been thinking about visiting Ladakh in July; then below in this article you will find a few tips on how you can plan your journey for better. Your final travel will of course depend on factors like how you are traveling; and how many days you have in hand; but the information below can at least get you started on drafting your itinerary. I will include a few tips on what you can expect while traveling to Ladakh in July; followed by a suggested itinerary in the end. If after reading the article you have any other questions, then you may ask those in the comments at the bottom of this page. Until some time ago, a trip to Ladakh by mostly done by motorcycle enthusiasts. That is actually how the term “Biker’s paradise” was coined. Much now has however changed. Other modes of transport too now get used in an equal manner. While majority of the people still travel by their own vehicle, a lot others reach Ladakh either by air; or by public transport; or in a rented vehicle. If you too were planning to board a flight for Leh city, then acute mountain sickness, also known as AMS, will become your first concern. You will definitely be suffering from it on your first day of arrival and possibly even on Day 2. Slow gain in altitude and plenty of rest is the best prevention against altitude sickness which does not really happen in case of a flight. You are at your home and then at the airport in plains; and then in about one hour, you bring your body to an astounding height of 3,500 meters at Leh city. This gain in altitude is sudden and faster than your body can cope with. So once you arrive in Leh city and until your body gets accustomed to the new height that you have brought it to; you will be suffering from altitude sickness. In several ways would feel like the same way like you did when you were running a high fever. There is really little that you can do about it and will just have to rest and allow time. Your Day 1 would have to be spent completely at the hotel; and you cannot really afford to be running around and exhausting yourself. For more details on what AMS is, its symptoms; and prevention, please read How to Deal With Acute Mountain Sickness in Ladakh. If you were coming to Ladakh by rented motorcycle or car; then your biggest concern will be that vehicles rented outside Ladakh are not allowed for sightseeing here. And yes, this also applies to Leh city. For example, if you rented a bike from Manali or Srinagar, you can only use it to arrive in Leh City. Once you check into a hotel, you will then have to leave it parked at the hotel and rent another bike in Leh for local sightseeing; and for visiting areas like Nubra Valley, Pangong Tso and Tso Moriri. This is a serious concern and please do not take this lightly. Locals put up barriers on these routes and if they catch you, you will be sent back on your way to Leh city. There also have been incidents of non-local rented vehicles being attacked, vandalized and forcibly taken. No matter how you arrived in Ladakh though, everyone is required to obtain Inner Line Permit in order to visit areas of Ladakh. This permit is a mandate and without it, you will not be allowed to travel any further than Leh city. There are Army check posts in between the routes where you will have to submit photocopies of your permit. It can either be obtained in person from DM Office Leh; or applied for online. For more details; please read How to Obtain Inner Line Permit for Ladakh. When it comes to mobile and data connectivity in Ladakh, it is pretty much limited to Leh city only. BSNL here has the widest coverage; but it is only Leh where you will get a stable connection with good voice clarity. All other networks will be dead the moment you leave Leh; but you will get intermittent BSNL connection in Nubra and Pangong as well. Voice clarity will be extremely bad but you will at least be able to send text messages if needed. For more information on this topic, please read Mobile Services in Leh and Other areas of Ladakh. Is Ladakh Open in July? The answer to this question is a definite yes. Ladakh is completely open in the month of July including both the Manali – Leh and Srinagar – Leh highway. All internal roads leading to areas like Nubra Valley, Pangong Tso and Tso Moriri are accessible as well. Since it is the peak tourist season, all hotels, guest houses and tourism related activities too are operational. You can arrive in Ladakh in July and will have no problem finding a place to stay; or a place to eat at; or other service like motorcycle rentals, taxis or public transport. Yes, July is the time when Monsoon arrives in Himalayas. The valleys around Manali, Lahaul and Kashmir start to experience rainfall at this time which can vary from being moderate to so intense that it can even trigger landslides. Most of the chances of rain however are on your way to Ladakh, on Manali to Leh and Srinagar to Leh highway. Ladakh is in a rain shadow area so it is supposed to either not rain here at all, or rain very less. There could be occasional rainfall at top of the passes which can even block the road for a few hours or even a day, but Army restores connectivity just as soon as they are able to. If possible, I will recommend that you plan your trip in first half of July because as the month progresses, the intensity of monsoon season too will increase. Let me put it like this. It has been a while since summer arrived. Roads have all opened and sun has been shining bright. Snow has all started to melt and is feeding its water to the numerous water streams, also called “nallahs”. Now since it is July, Monsoon too has joined the party and is contributing in form of all the rain. Get the idea? Yes, you will have to be prepared for a lot of all those water crossings you have heard about. Some of these will be easy but some deep enough to swallow an entire bus. Jokes apart but yes, a trip to Ladakh in July means that you will have to cross several of these water streams on the way; and must be prepared accordingly. These small rivulets will be present on not only on Srinagar – Leh and Manali – Leh highways; but also on the internal roads in Ladakh. If you were on a motorcycle trip, then you need to keep this in mind while you pack your bags and decide which shoes to bring. Rubber Sandals that can cover your entire feet can be a good replacement to make sure that you do not end up wetting your shoes at every water crossing. If you were traveling by car, then make sure you are bringing the one with good ground clearance. Crossing these water streams and slush areas would be tough if your car did not have good GC. Check your tires before you start on the trip. If the tires are old and worn out, replace them. Ride in a lower gear very slowly through the slush. Ride through the tracks made by four wheelers and trucks as the slush is less there. One thing that you need to be prepared for is driving through slush and water crossings in july. There are several areas on both the highways where rain plays havoc creating a lot of slush, like Rohtang on Manali Leh highway and Zoji La on Srinagar Leh highway. Heavy rains can wash away parts of narrow road leaving vehicles struggling through slushy bends. Taking your car across such stretches can be a challenge and you need to be extra careful while doing so. Next concern is of landslides caused by rain and to tackle that, you must keep a couple of days in buffer. There is a high possibility that certain part of the highway may close down for a few hours or even a couple of days because of landslide in which case you will have no choice but to go to the nearest town and wait it out. You also need to be careful while driving through areas that you see effected by rain or have a lot of dirt or mud around because it is not always a major landslide but smaller ones too. Some stones may just slide down from the top damaging your vehicle and injuring you. Good part however is that BRO has put up warnings in areas where this may happen. If you see a board that reads “shooting stones”, stay alert. So far I have always advised people to not book their accommodation anywhere in advance. This would just have meant paying more money which actually it does even now. The situation now however is that tourism in Ladakh is at an all time high. The number of people visiting here goes up by each passing year which is limiting the accommodation choices in tourist season. In June 2018, it got so crowded and overbooked that tourists had to return from Pangong lake; because there was just no place available anywhere to stay. People went there in the morning; made it a day trip and came back to Leh city on the same day. Even in other parts of Ladakh including Leh, a similar kind of situation took place; where people found it hard to find a hotel per liking. What I am trying to say is that now if you are going to Ladakh in July, August or September; it would be wise to just book your stay in advance. It is quite in the similar lines to accommodation. So many people are flying to Ladakh with families that taxi drivers there are all completely booked for season. That is correct. It is now hard to get a private taxi in Ladakh. There was a time when these taxi drivers were fighting among themselves for customers; but the situation is just the other way around now. So yes, if you are visiting Ladakh this July; and have plans to rent a private taxi, it would be better to book one in advance. You may contact Nasir in Leh @ 9906229203. He runs his own taxi there and is a reliable contact. Give my reference and if he is available then book him. If not, he can at least direct you to some other reliable driver. When it comes to renting a motorcycle however; I would still not recommend booking one in advance; unless you have a reliable contact there. I would still suggest that you first reach Leh,; take a test ride of the motorcycle; decide among a few; and then make a final decision on which one to rent. Srinagar Leh highway usually gets declared open sometime in April any by July, the road is completely stable. You will still find BRO working at several sections of the road but by July, it is mostly smooth all the way. The worst patch of the road will be at around Zojilla. Apart from this, there will be a few other bad patches but nothing too troublesome. There will be a few water crossings as well on the way; and your chance of encountering rain will be highest between Srinagar and Drass. In terms of difficulty, Manali Leh road is a clear winner with all its bad roads; 5 passes and numerous water streams. If you are traveling from Manali to Leh by road in July; then you will find the entire stretch open; but there is no guarantee on how the road conditions will be. This road gets declared open sometime in June and usually is in its best shape by September only. There was a cloudburst on Manali Leh Highway in July 2017; due to which thousands of tourists remained stranded on the road for over 24 hours. So yes, there is a chance that you will have to face rain; which increases even more if you were traveling in later half of the month. As you can probably already guess from what you read above, you will definitely have to carry a rain gear; or at least a water proof jacket that you can put on if it started to rain. Apart from this, just bring your regular cottons, a few light woolens and a heavy windproof jacket and you will be OK. Do not forget to pack your gloves and if possible, buy a waterproof pair. When packing your jacket, make sure you have one that can also protect your face and neck. For more details on clothes to pack, please read Clothes for Ladakh Trip – What to Pack? I have explained the road conditions from Manali and Srinagar above. Apart from this, internal roads in Ladakh in July will mostly be a mix of good, bad and ugly. The roads to Nubra and Pangong are mostly good except for a few bad patches at Khardung La and Chang La top. Road to Tso Moriri will be both good and bad depending on which route you take. Changthang Valley ( Hanle, Chushul) is a mix of super smooth, smooth, bad and ugly stretches. Slush and water streams will mostly be limited to top of the passes on internal roads. Every major and minor tourist attraction in Ladakh can be visited in the month of July. Major tourist places like Leh city, Nubra Valley, Pangong Lake and Tso Moriri are definitely all open; and should be on everyone’s list to visit. Apart from this, other places like Hanle and Sham Valley etc too are open for tourism provided that you have proper permits to visit here. Snow in Ladakh is mostly all gone by July. You will definitely find some at top of the passes like Rohtang, Baralacha La, Khardung La but it will mostly be limited to just there. You will definitely not witness a live snowfall unless you were running good on luck and caught one at top of the passes en route. July end is really not the best of the times to be visiting Ladakh and Monsoon again is the reason. All the global warming has changed things a lot and even though Ladakh is a rain shadow area, even here the cloudburst of 2010 killed so many people. If you can, then either plan for early July or push your trip to September. If you cannot, then at least be prepared for monsoon. Also read: How to Travel to Ladakh with Children or Infants? There was a time not too long ago when public transport in Ladakh was scarce. Bus service was not that frequent and finding shared cabs was a challenge. That however is not the case anymore. Authorities have taken steps to ensure better connectivity; and now even a local bus service in Leh city is operational. Public transport will be all available in Ladakh in July; and even if you could not find a bus, you can always catch a shared cab from Leh bus stand every morning. These cabs run in every direction so no matter what your destination is, you will easily be able to make it there and back. Weather in Ladakh in July is mostly pleasant. Days will be moderately warm but nights will still get cold. Day temperature will be above 25 degrees Celsius and will drop to 10 to 15 degrees Celsius at nights. This can drop even further down at places like Pangong Lake. Monsoon arrives in later part of July and if it rained too heavily, it can cause flash-floods as well. Yes a road trip is still a better way to travel to Ladakh. Minimum or recommended time for a road trip will be at least 12 days if you truly want to enjoy the journey. You can reach Leh city via Srinagar, spend a day in Leh to obtain passes and local sightseeing; go to Nubra valley; reach Pangong via Shyok road; come back to Leh and then exit via Manali. You can also cover Tso Moriri either via Chushul or Chumathang. I have suggested an itinerary for the trip below. So if you had a total of 14 days, below is how you can travel. For the sake of this article, I will assume that you are traveling from Delhi. If your starting point was different, then only the journey for first and last day will change; rest of the details will still apply. Yes, of course. You can definitely plan your trip to visit Ladakh in July. Just keep the above points in mind and have a safe journey. If you have any further questions, please feel free to ask in the comments section below; or at our Community Forum; and I will be glad to answer. Thank you for informative article. we are panning a family tour to Leh and Ladakh during July 2019. My mom who aged 75 years. we will be travailing to Leh by air. I hope my mom should be able to join. Any thoughts on that. Hello Harsha – Please see the article below. Should answer your question. Thank you Vargis, this site is really helpful. Me and my wife are planning to visit Leh in July. We will arrive by flight and wants to cover nearby places for 4 or so days and take flight back home. But nearby places are quite far ranging from 100 to 300 km. Could you please suggest best suited itenary? And more importantly should we plan to stay at those places or daily come back to Leh, considering safety measures? Hi Kushal – How are you planning to travel locally in Ladakh after you land there? Private taxi or public transport? Hi Vargis, thanks for reverting. We are planning to take bike for local travels. I want to go Laddakh in july with family atleast 20 persons with children. I am sorrry but I do not have any recommendations for travel agencies. Please let me know whether there are any hrtc bus directly operates between manali and leh (without stopping at keylong) ? We’re planning to complete Manali- Chitkul-Spiti-Manali. Then again start from Manali – Leh- Manali circuit in one single trip. We’ve around 15-16 days in the month of September. Sep 9 (Day 2) – Manali local sight seeing and bike rental. Sep 19 (Day 12) – leh to kardunga la. From khardung la to diskit, turtuk and panamik. Q.Where to stay at nubra ? Q. Can we cover all the places mentioned above in a single day ? Q.Where to stay at Tso Moriri ? Q. Is it advisable to cover hanle in b/w ? Can we cover zansker & suru valley as well ? Kalpesh – I am confused about your starting point. Did you mean Shimla to Sarahan? Because that is how it should be. No Sir, we’re travelling from Manali ! We’ll take a flight from mumbai to delhi.Then a overnight journey to manali. Then you should change it and go to Shimla from Delhi. Your starting point should be Shimla if you want to cover Sarahan and Chitkul. Then from Shimla, you will circle back to Manali. 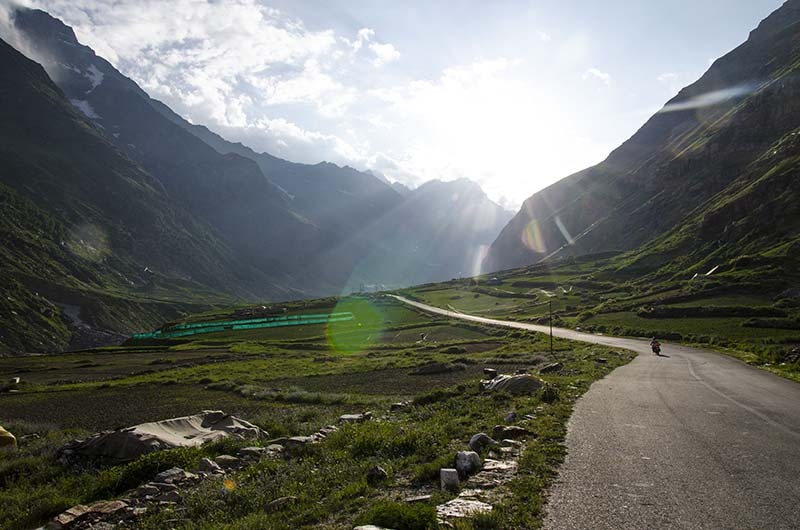 Actually i want to cover chitkul – spiti through rented bike. So i have to return back to the original place from where i have rented the bikes. So as per your itinerary i have to come back to shimla from manali then head towards Leh..
Pl. Respond to my other queries in the original post. Which other query Kalpesh Bhai? Q. Where to stay at nubra ? – diskit, hunder, panamik, turturk. 1. Stay at Diskit or Hunder. These places has wider range of hotels. 2. No you cannot. From Leh go to Diskit and stay there. 6. A lot of guest houses in Karzok now, Just walk around and decide on the one that looks the best to you. 7. Zanskar and Suru you cannot do unless you have another 4 days in hand at least. See these posts please in case you want to call in advance and book. You can but the low GC will cause problem. You will have to be extremely careful to avoid any damages to your car, specially at water crossings. Plan towards late September or early October. It will be the end of tourist season so you will be able to negotiate the prices down.